Like to play the slots at land casinos? So do we. 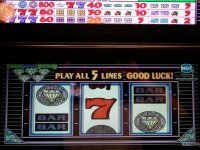 Slot machines don't always offer the best odds of winning at the casino. They are programmed to be completely random which makes them almost completely unpredictable. However, there aren't many casino games where you stand to win as much by placing such small bets. Million credit slot jackpots have been won by people betting less than a dollar. And they are just plain fun. In our travels to land casinos, we've been lucky at the slots on a few occasions. We haven't won any life-changing amounts, but have enjoyed some modest (and one or two larger) wins. Have you ever found a slot machine where you simply cannot lose? 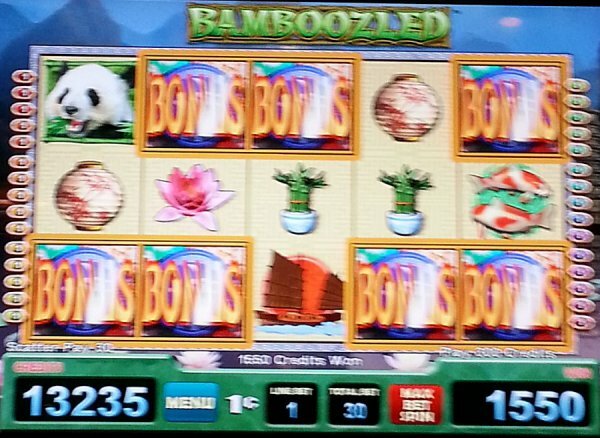 I happened onto Bamboozled, a fun panda-themed video slot and started on quite a roll. This whimsical game from WMS includes colorful symbols and is part of the Spinning Streak series. 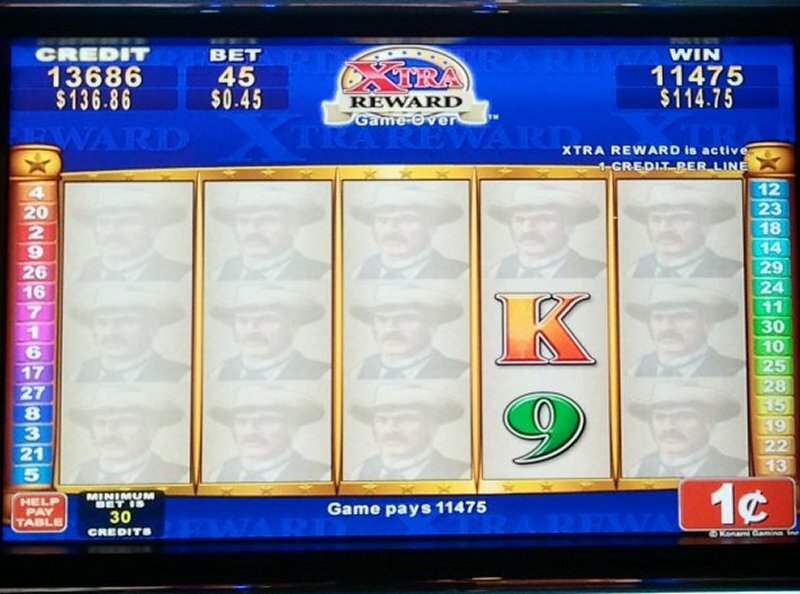 With these slots, every time you score a winning combination, the spinning streak feature is activated where your winning symbols remain in place as the reels re-spin. If more matching signs appear, they also remain and the spinning streak repeats. You can accumulate some big payouts this way. It's possible to fill up the entire board with pandas or idols - two of the highest paying signs - and I've come close to seeing that happen. In this session, I started with only ten dollars, and parlayed that up to $200. I was at this machine for literally five and half hours - no joke - almost fell asleep while playing. It seemed like every other spin triggered the spinning streak, and I hit the bonus (pictured) eighteen times. This win was a quick hit. 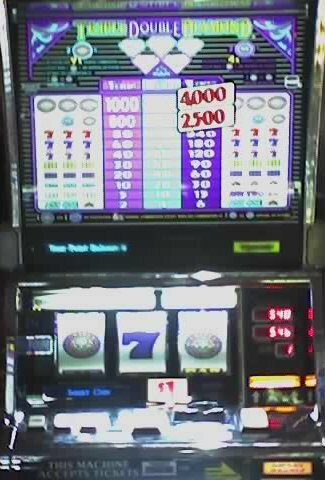 I had just sat down and only played three spins on this five reel, forty payline vixen-themed video slot when seventeen (17) wild signs appeared on the reels. I'm not entirely sure, but I think this made for at least a few jackpot wins, as five wilds are the highest payout at 1000 credits (see larger photo). My 40 credit bet (40¢) resulted in a 10540 credit win ($105.40). 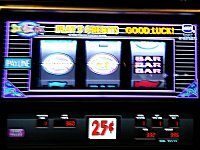 What slot player hasn't dumped buckets worth of quarters into these 3-4-5 times pay machines that are seemingly ubiquitous on American casino floors? 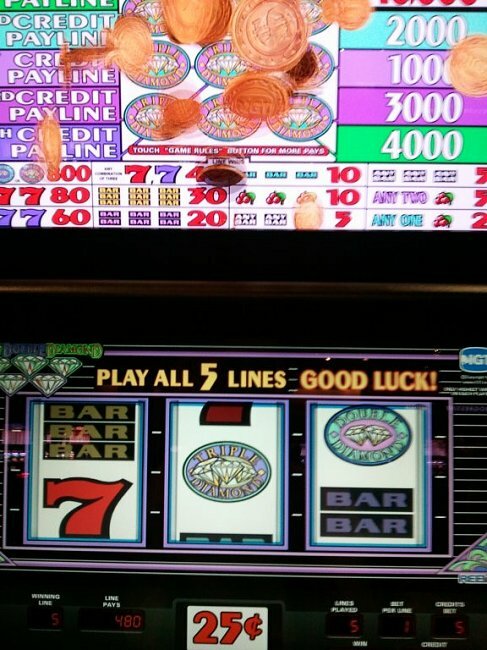 This time, it was a Double Diamond quarter slot. 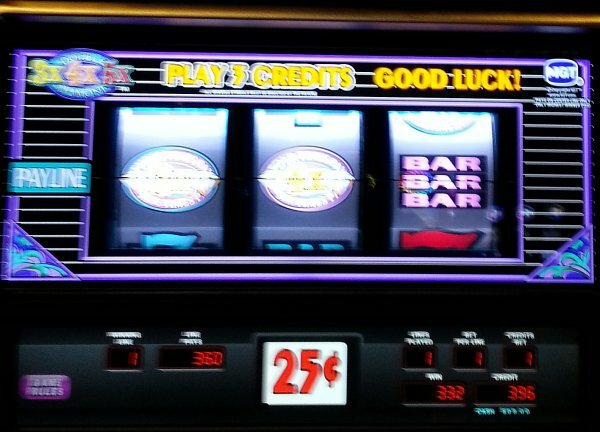 I was only betting one credit (25¢) and hit the 3x-4x-triple bar on the payline. Three triple bars normally pays 30 credits, and the 12X (twelve times) multiplier made that 360 credits ($90). This is a fun video slot by Konami featuring an outlaw western theme. I was betting 45 coins per spin (45¢) and luckily landed the Marshall symbol (highest paying) on all but two spaces. This combined for many payline wins, including a couple five-Marshalls. When you get a good win on these, animated coins rain down. My 0.45 credit bet ended up returning a 114.75 dollar payout. On a side note, only a couple minutes later lightning from a passing storm hit the casino and briefly knocked out power, which caused all the slots to reset. Fortunately, my machine rebooted with credits intact and I was able to cash out. This is still my biggest win to-date on any slot, online or land-based. (apologies for the slightly unclear photo - it was taken on a flip phone quite some time ago). I'd basically just arrived at the casino, having played the dollar slots for all of ten minutes. I was down a total of $12 when I placed a one credit ($1) bet on this Ten Times Pay machine. 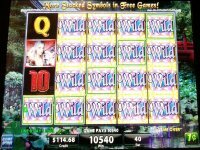 Two ten times pay wild signs came up with a seven on the payline, which made for 100X (one hundred times) the 777 win. 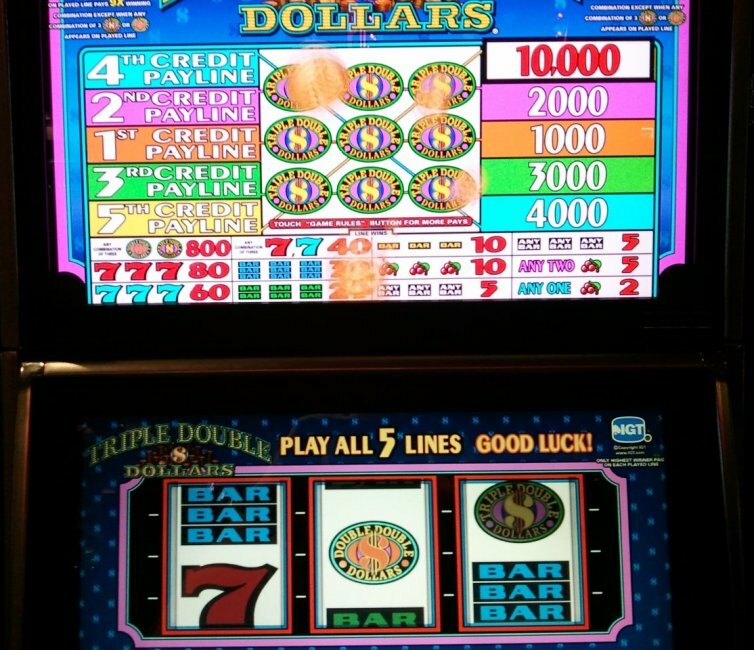 Triple red sevens normally pays 50 credits so that turned into $5,000. Needless to say, I was a happy camper as the slot attendant counted out a big stack of bills into my hands. I thought about trying for a second jackpot, but decided to call it an early session. This win isn't particularly spectacular, but if you've ever experienced bad luck at the slots, then it's certainly appreciable. 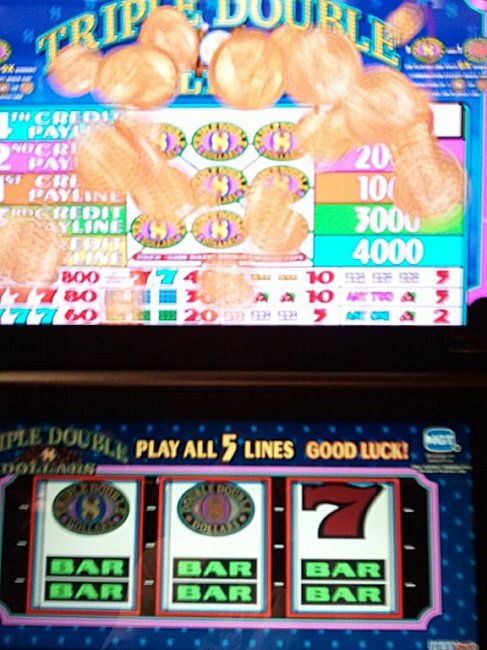 This time I was playing a three-reel Triple Double Diamond machine at one credit (dollar) per spin. I landed two of the wild triple diamond signs and a blue seven on the payline. 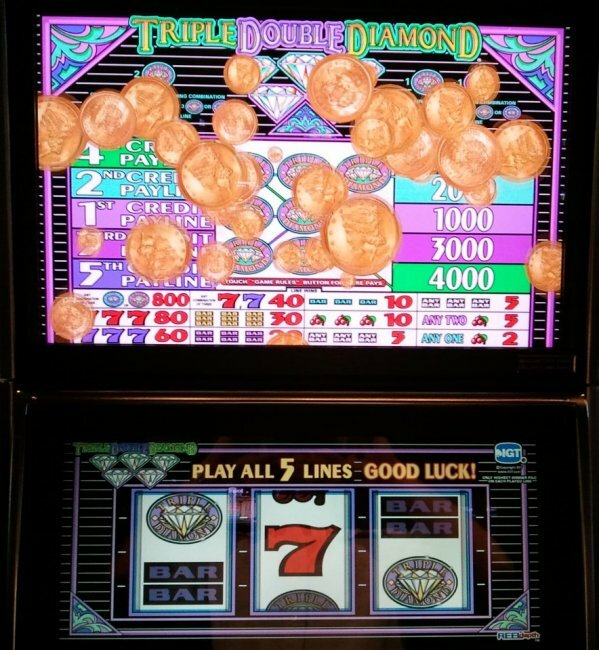 Three blue sevens normally pays 60 credits and the triple diamond signs multiplied that 9X (nine times) for a total win of 540 credits (540 dollars). 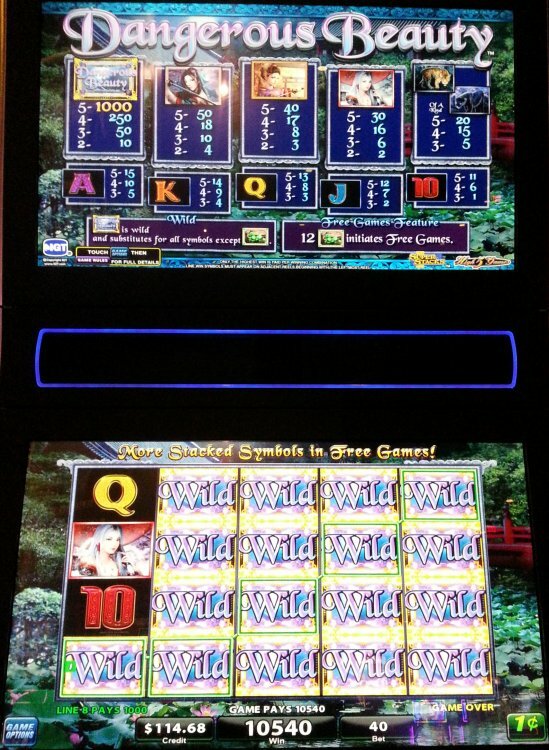 During my last trip to Vegas, I made sure to try the new (at the time) reel depth slots by IGT. 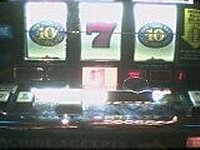 On this occasion, I was betting 1.25 credits per spin and hit red seven - triple diamond - double diamond win on payline 5. 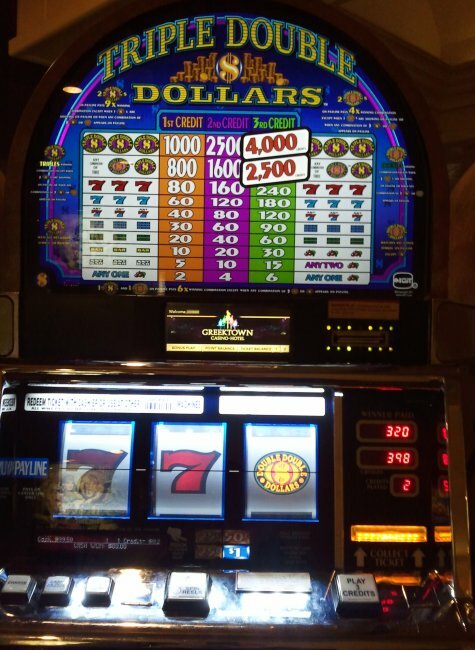 Three red sevens normally pays 80 credits, and the wild signs multiplied that 6X (six times) for a total of 480 credits ($120). A little later in the same session, I bested the previous win by getting a triple diamond - red seven - triple diamond for a 720 credit ($180) win. This machine was paying out out pretty well. After the initial luck, I raised my stake to 2.50 and even 5 credits for a number of spins. Feeling lucky from my good fortune at the other machine, I hopped over to this Triple Double Dollars reel depth game. 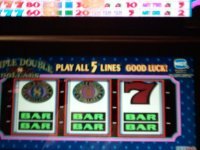 I was betting 1.25 credits (dollars) per spin, and scored a three sevens payout with the double dollars and triple dollars wild signs completing the payline. Three sevens pays out 80 credits and the multipliers made that 480 credits (120 dollars). Later on at the same game, I won an identical payout with the same signs in a different order: triple double - double double - red 7 across the 2nd (uppermost) payline. Same bet, and another 480 coin (120 dollar) payout. This was a humble win during a tight session at Detroit's Greektown Casino. 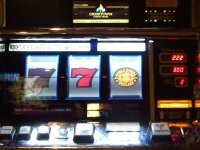 I was betting 2 credits (50 cents) per spin and landed two red sevens with a double dollars symbol on the payline. Three red sevens normally pays 160 credits, and that was doubled to 320 credits (80 dollars). This win made what would become a surprisingly terrible session a little more bearable. Play a variety of reel and video slots at one of the internet's leading casino sites.